Wayne Kostroski started Taste of the NFL in 1992. SAN FRANCISCO -- Twin Cities restaurateur Wayne Kostroski is at work preparing for his annual Super Bowl event, the Taste of the NFL, also known as the Party With A Purpose. The event has raised $24 million over the past 24 years. On Wednesday afternoon, he was unloading boxes of helmets that will be auctioned off or sold at the event Saturday night at the Bay Area's Cow Palace. "It's not glamorous, but God it feels good," he said. The palace was a concert venue where the Beatles, the Rolling Stones and Jefferson Starship played, Kostroski proudly pointed out. The Taste of the NFL started in Minneapolis in 1992, in the atrium near what was Leeann Chin's downtown Minneapolis restaurant. Kostroski, who now runs the Franklin Street Bakery with his business partner, said back then he was on the Super Bowl Host Committee and trying to lure chefs north for the event. "The challenge was how to make people come to Minnesota in January, particularly the southern chefs," he said. Kostroski pitched them on volunteering their time, bringing their own food and "freezing their butts off," he said. And it worked. Chefs came from the 28 NFL cities at the time. The reward: Food banks in all those cities benefitted. For this year's 50th Super Bowl, the Taste of the NFL will have a chef from each of the NFL's 32 cities paired with a former player from the team.There will be food and wine at each of the chef's stations. Kostroski expects 2,400 to attend the event, which also features Third Eye Blind as its musical guest. The biggest event was held in New York, with 3,100 attendees. And from Wisconsin's culinary capitol, Justin Aprahamian from Sanford Restaurant will serve manchego cheese with quince preserve and candied almonds. As for me, I hope to try the fried foie gras peanut butter and jelly sandwich from the Prado at Balboa Park in San Diego, from chef Jonathan Hale. Kostroski offered a piece of advice for anyone who will be attending: "Stop eating today," he said, to save room for all the food. Nonetheless he provided a restaurant recommendation for those visiting San Francisco: 1300 on Fillmore, where the food is fabulous, and neither expensive nor touristy. 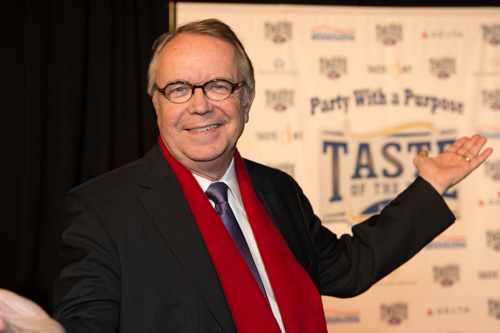 For more information on Taste of the NFL, visit http://www.tasteofthenfl.com.